As we all know, Google loves to change the way they do things and it isn’t always for the better. 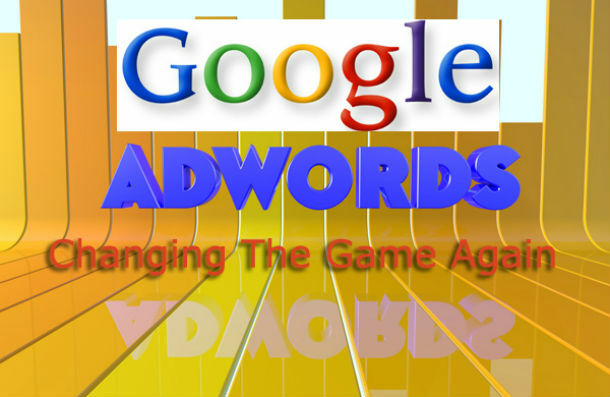 Now they have made some major changes to their Google Adwords program. If you’ve done any searches on ““`Google since February 19th, you’ll notice the right side of the page is devoid of ads now. Just a big blank white area instead of the usual text ads displayed there. WHAT CHANGES DID GOOGLE MAKE TO ADWORDS ON THE SEARCH RESULTS PAGE? Let’s start with the frontend, what potential customers see when they type in search terms or keywords that you might be targeting with your Google Adwords campaigns. HOW WILL THESE VISUAL CHANGES TO GOOGLE ADS AFFECT YOU AS AN ADVERTISER? There will be a huge affect. There have been several studies that suggest when there are three or more ads at the top of the search results, as many as 65% of users click one of the ads rather than the number 1 organic listing. So, even if you are number one organically, only 35% of searchers might click on your listing. That percentage drops dramatically for number two, three, four, etc. Now, take that same information and apply it to anything that is all the way at the bottom of the page. only the 35% go past the top ads. Some of those are going to click an organic listing. The only people that will even see the ads at the bottom of the page are those who skipped the top ads and all of the organic results. That means you have to be a top bidder and have highly relevant ads to make sure your ads are appearing at the top of the page. If they are appearing at the bottom, forget it. This may also result in lower quality scores where it isn’t your fault. Google counts the number of impressions, the number of times your ad is displayed on the page vs the number of click throughs as part of the quality score. So, if your ads are being loaded at the bottom of the page and people aren’t seeing them, the ratio between impressions and clicks will give google a false impression of the effectiveness of your ads. Low quality scores result in higher costs per click. So, there really isn’t seven ads, at least not seven that are worth having. The three to four ads at the top is the only way to be effective now. WHAT OTHER CHANGES ARE HAPPENING WITH GOOGLE ADWORDS? Some new tools on the backend may bring a little better news to you as an adwords advertiser, such as campaign drafts and experiments. Drafts let you prepare and review multiple changes to an existing campaign before implementing them. Experiments lets you test changes to your campaigns in a controlled environment. Automated Adwords Bidding has been improved. You can read about that here. They are finally getting rid of flash ads and giving you the tools to convert them to HTML5. Here is the HTML5 Toolkit. The AdWords app for Android updates include universal app campaigns and new conversion columns. WHERE CAN I GET HELP WITH GOOGLE ADWORDS? Right here. The Pittman Group has managed millions of dollars in advertising through Google Adwords and keep up with all of the latest changes. Instead of just reacting to new changes, we test and experiment with how new changes will affect our customers. These latest Google Adwords changes have been speculated about and tested for the past few months and the launch and announcement came on february 19th. Rather than just announcing the news, we looked into it and waited until now to report the news along with how it affects you as a Google Adwords customer.